Ordering is easy. Email me with the item number(s) and description of what you want to purchase. Checks or money orders accepted. When your order is received, I will let you know the total amount due including any sales tax and shipping. I will notify you as to when to expect delivery. After payment is received and processed, your order will be on its way ! I also sell my hand knit winter hats seasonally through the Greenfield Village Store in Dearborn, Michigan. 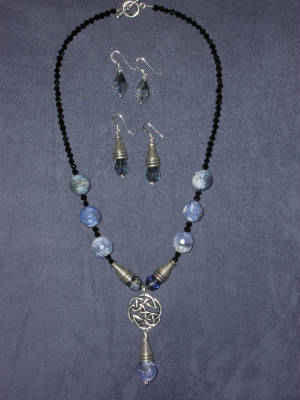 Each piece of jewelry is individually handcrafted by me, using a unique assortment of stones, glass, crystals, pearls, and metals. Due to the natural variations in these materials, expect your jewelry to be one-of-a-kind. 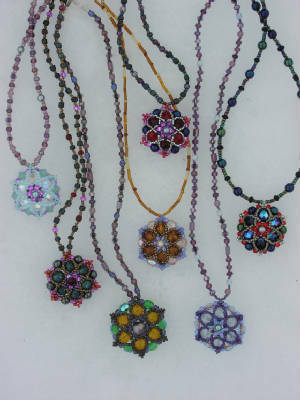 Necklaces are strung with silk or high quality beading wire. 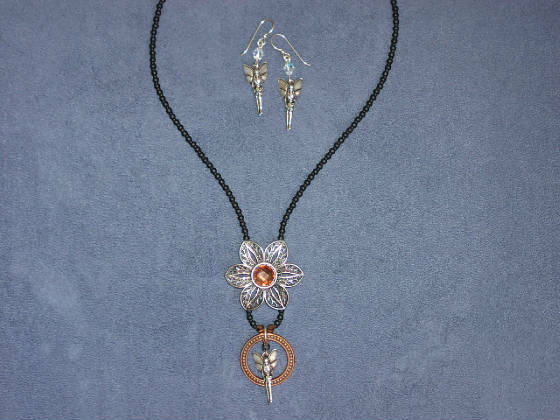 Metals used are sterling silver, 14K gold-filled, or non-tarnish Artistic Wire. Ear-wires are made of silver filled, 14K gold-filled, or niobium-- all hypoallergenic metals. Everything is made to fit well, to be tangle-free, and to LAST! 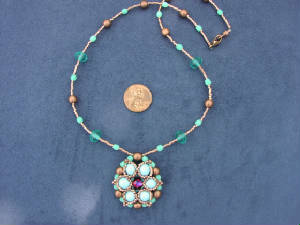 I've had such a fun time over the years, making jewelry inspired by Indian, African, Victorian, and Elizabethan designs, to name just a few influences. I welcome your comments and suggestions. Thank you. 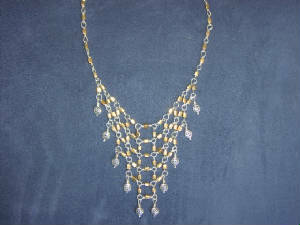 # 248: Hand wrapped wire bib necklace with gold glass cubes and Celtic drops. 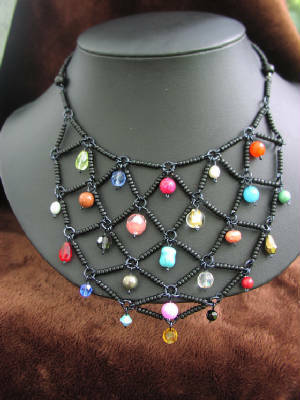 This design will not tangle, drapes nicely on neck. Made with non-tarnish Artistic Wire in silver. Approximately 16" long with extender. $75. 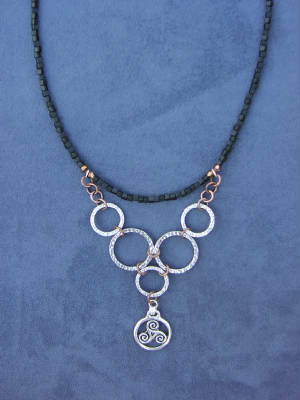 # 515: Bib necklace with Celtic triskele pendant and frosted glass, 19" long: $48. 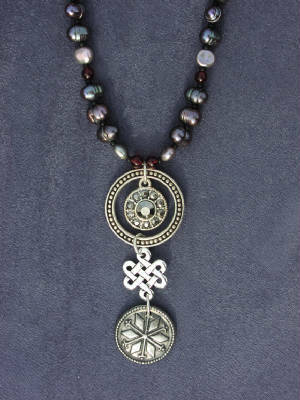 # 506: Freshwater pearl and garnet necklace with Celtic knot, pewter button from Norway, and marcasites, approx. 16" long: $48. 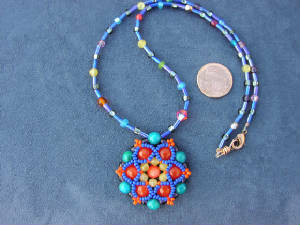 # 513: adjustable length bib necklace with Czech. 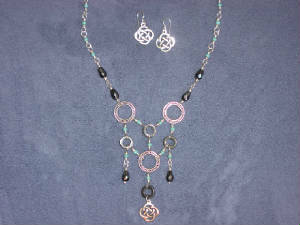 glass, hematite circles and Celtic heart: $42. 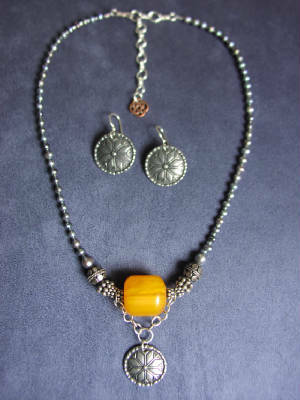 # 380: Freshwater pearls, sterling silver, West African amber, pewter button from Norway in "Selbu" design: $52. Approx. 16" long with extender chain and Celtic knot dangle. 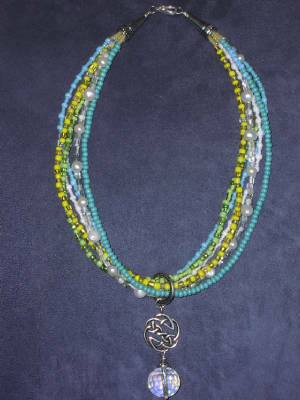 # 352: Light as air sterling chain necklace with pewter Celtic triskeles, Celtic teardrop glass, and dyed jade. 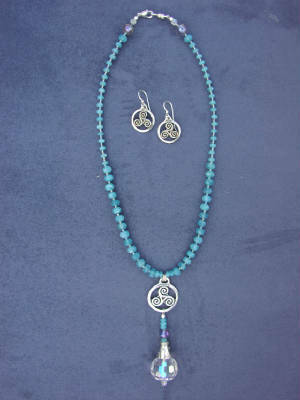 Fits best high up on the neck, specify length. $52. 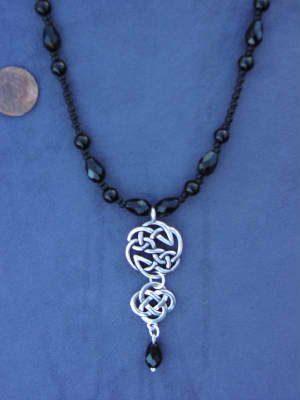 # 494: Gothic inspired Celtic necklace with Czech. glass, approx. 17" long: $36. 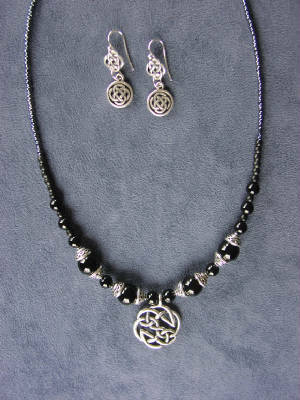 # 495: Gothic inspired double Celtic knot necklace with Czech. 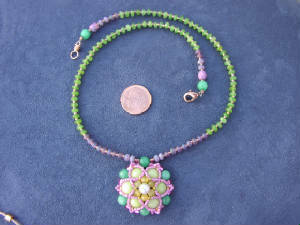 glass and dyed jade, approx. 17" long: $48. 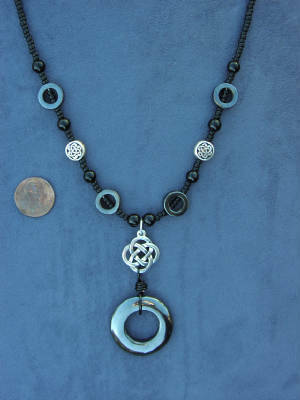 # 496: Gothic inspired Celtic necklace with hematite circles and dyed jade, approx. 20" long: $38. 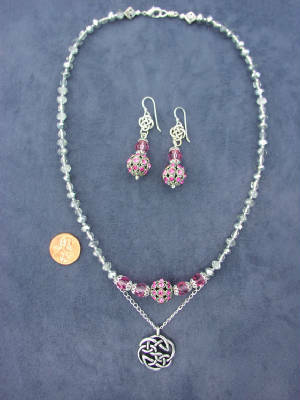 # 387: 17" Fire polished glass and crystal necklace with Celtic open heart pendant and front toggle closure: $48. 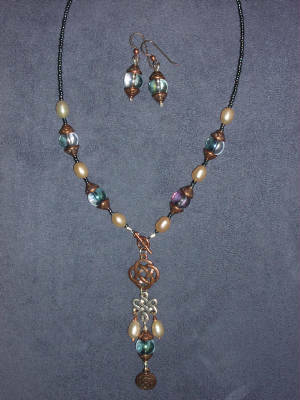 # 381: Multi-strand necklace with freshwater pearls and glass....the Celtic knot and fire-polished glass pendant is removable. Approx. 17" long. $42. 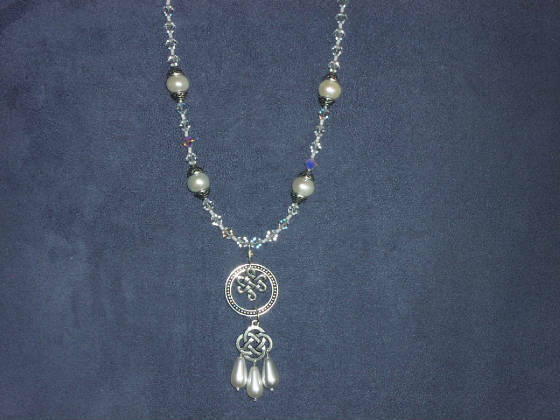 # 319: Pale lavender freshwater pearl necklace with Celtic triskele, Celtic knot and black Czech. glass teardrop. 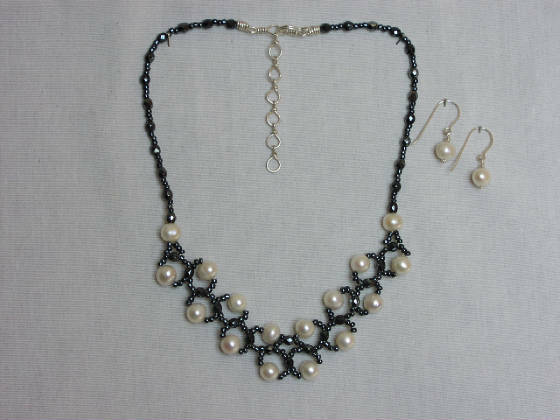 Matte black seed beads contrast with the pearls. 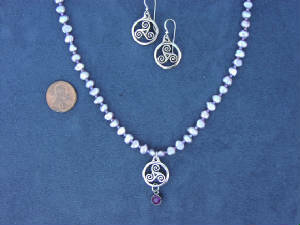 # 322: Pale lavender freshwater pearls 16" necklace with Celtic triskele and crystal drop.....very delicate and simple piece. $42. 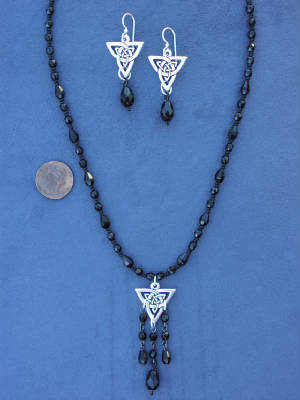 Matching Celtic triskele earrings with silver filled hooks sold separately $16./pair. 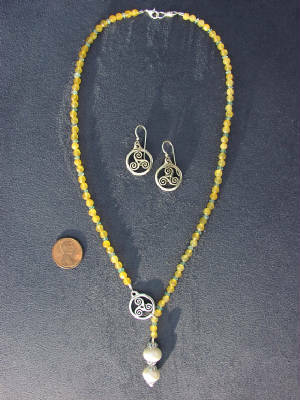 # 324: 17" sunny, lemony quartz necklace with blue apatite spacers, Celtic triskele, and 2 large freshwater pearls (about 10mm). Sells for $42. 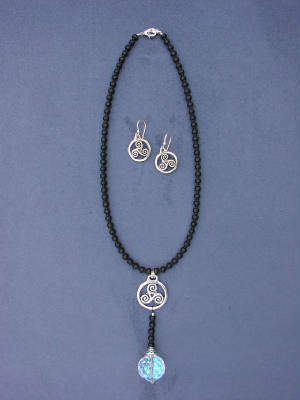 Celtic triskele earrings with silver filled hooks sold separately for $16./pair. 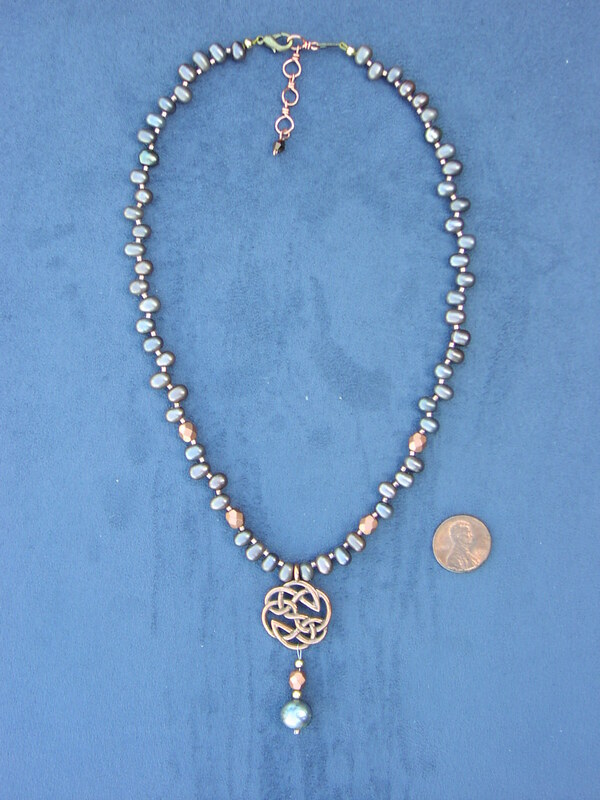 # 370: Front toggle clasp Celtic knot necklace with moukite stone, freshwater pearls, and glowing rose bronze glass beads: $48. 19 and 1/2 inches long. 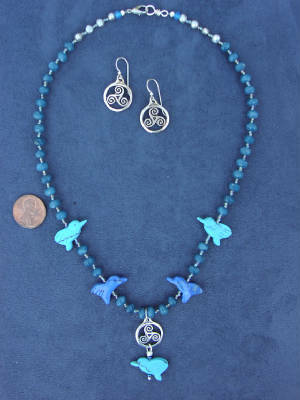 # 301: 16" Celtic knot necklace with bird pendant, quartz, and Czech. glass. $48. 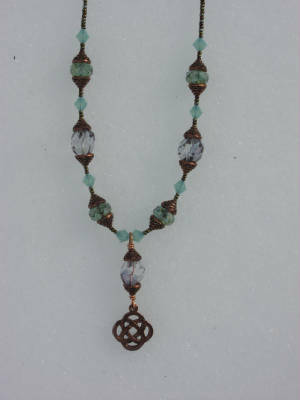 # 290: 17" necklace with beautiful quartz and antique crystal... Celtic knot and woodland fairy dangle below. Cool blue for summertime. Sells for $42. 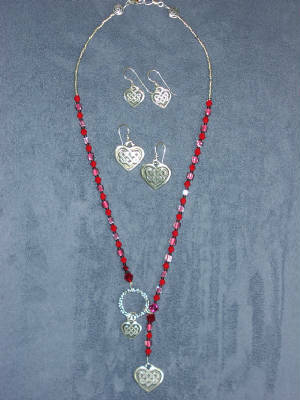 # 255: 17" asymmetrical Celtic open heart and rhodonite heart drop. 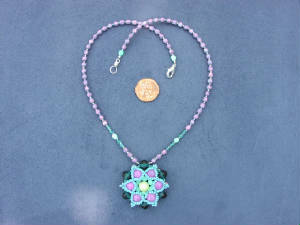 This piece has the look of a lariat but is much more comfortable, with no shifting and tightening until you are choking! 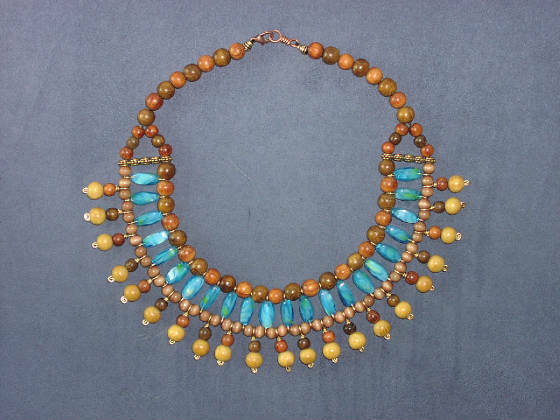 It stays in place and lays beautifully on the neck: $48. 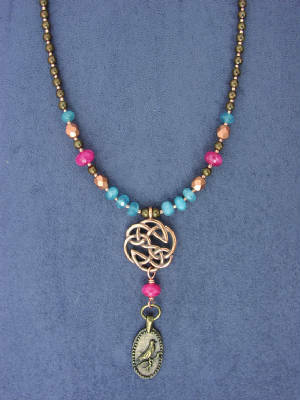 # 252: 17" asymmetrical Celtic knots necklace with turquoise and bronze colored glass: $52. 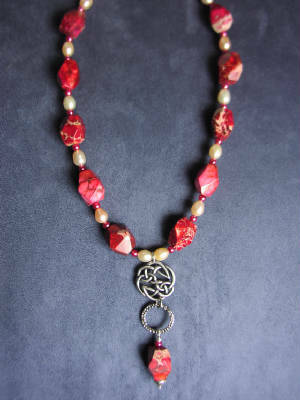 # 249: 17" Celtic triskele necklace, matte glass beads, and fire polished glass drop with Celtic braid bead cap. Minimalist and versatile! $48. 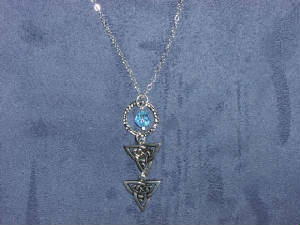 # 379 Crystal necklace with Celtic knot pendant and toggle closure, approx. 16": $52. Matching crystal bracelet (# 296): $36. 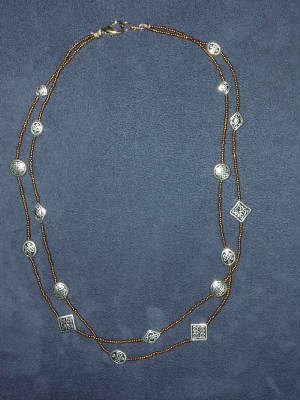 # 320: Top drilled silvery-gray freshwater pearls necklace with coppery Czech. 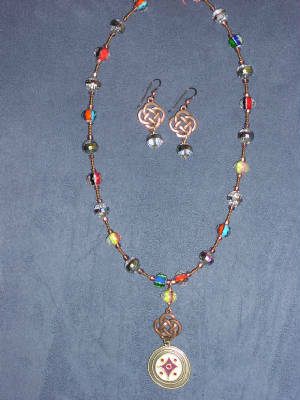 glass beads and Celtic knot pendant. 16" long plus extender chain. $48. # 286: Mixed metals, hematite and Czech. 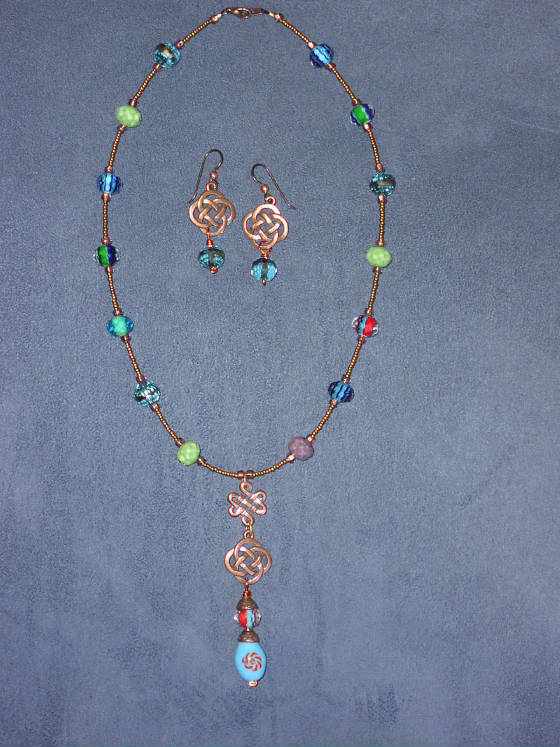 glass Celtic bib necklace with handmade chain, approx. 16 & 1/2" long plus extender. Matching earrings $16./pair. 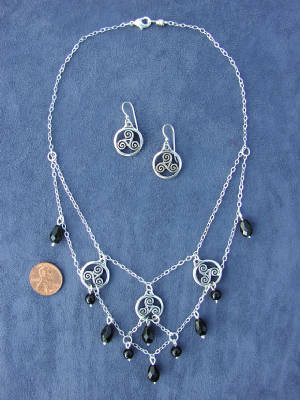 # 250: 18" Celtic braids and knot necklace with unique black floral centerpiece...bronze glass and silver toned pewter give this piece a kind of Victorian or goth feel! Lots of fun to wear: $48. 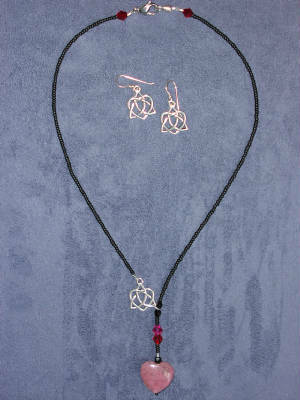 # 251: 17" fire polished glass teardrop and Celtic knot dangle necklace...a great neutral piece that shimmers: $48. 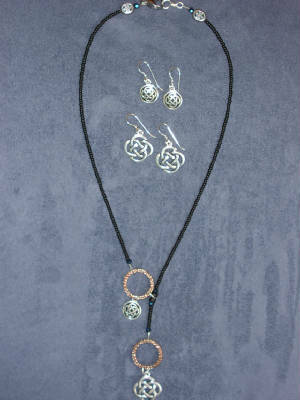 # 253: 16" Celtic triskele and Celtic knots necklace with organic shaped front toggle clasp and fire polished glass: $48. 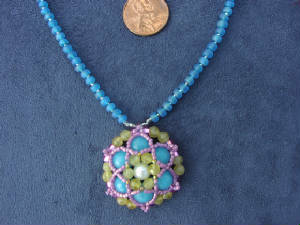 #378: Celtic knot pendant with chunky dyed agate and freshwater pearls: $48. 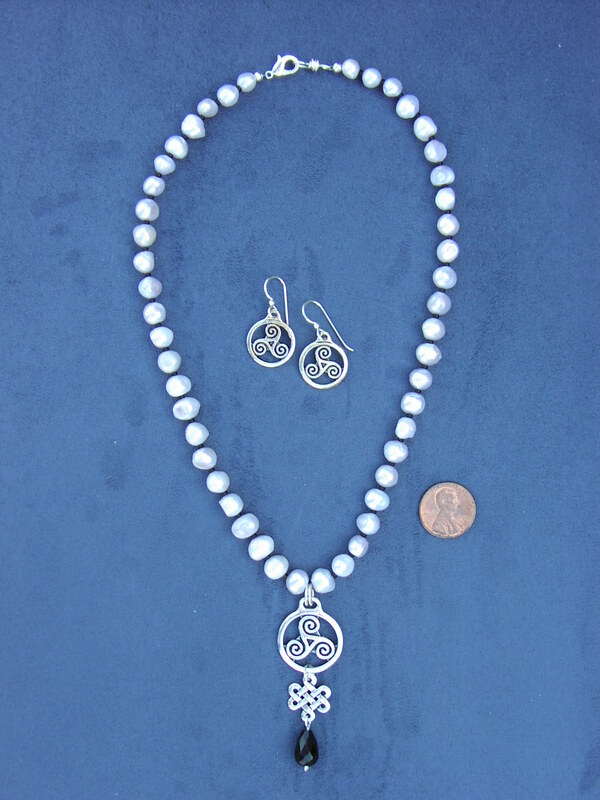 # 247: Celtic knot dangles necklace with crystal and pearls: $56. 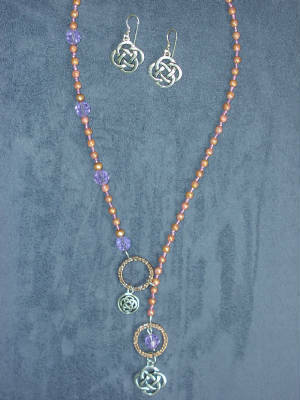 #184 Celtic knot necklace: $48. Made of pewter with Czech. glass and Swarovski crystal. 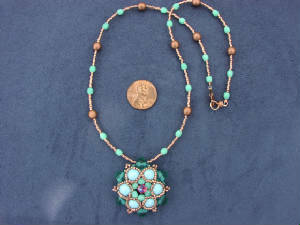 Shown in copper finish. Also available in silver and antique gold finish. Matching earrings: $16. 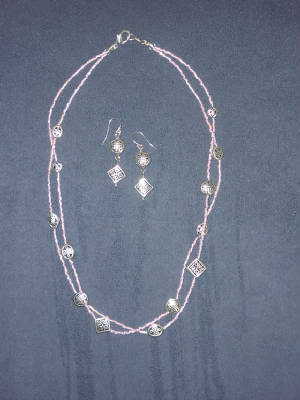 # 214, 234 and 235 above: Delicate 2 strand necklace with pewter Celtic knots, shown in pale pink, antique gold or black, can be made in any color: $48. 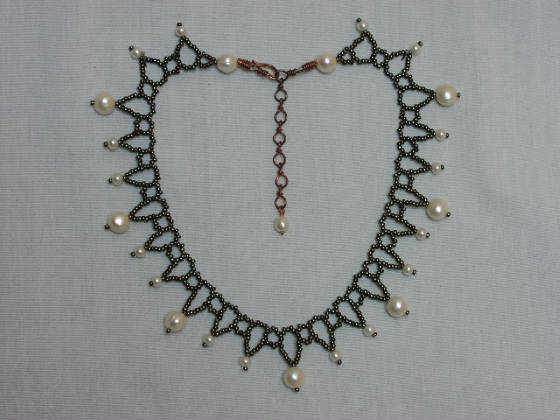 # 318: Multi-strand freshwater pearl necklace on hand knotted silk, beading wire and matte black seed beads: 16" long. $48. 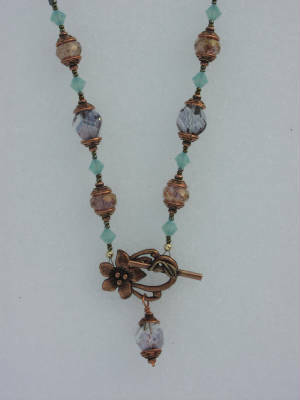 #183 Art Nouveau front toggle clasp necklace: $48. Made of pewter with Czech. glass and Swarovski crystal. Shown in copper finish. Also available in silver or antique gold finish. Matching earrings: $15. 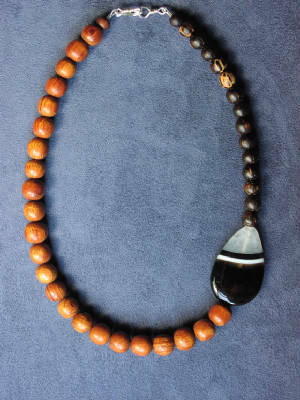 #106: Asymmetrical necklace made with wood and agate: $40. 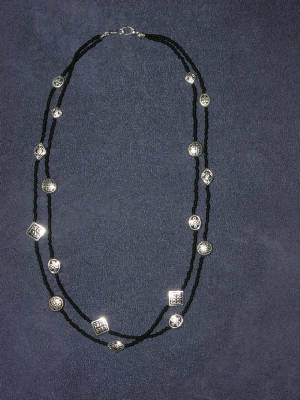 #007: Egyptian style collar made with wood and fossil beads: $50. 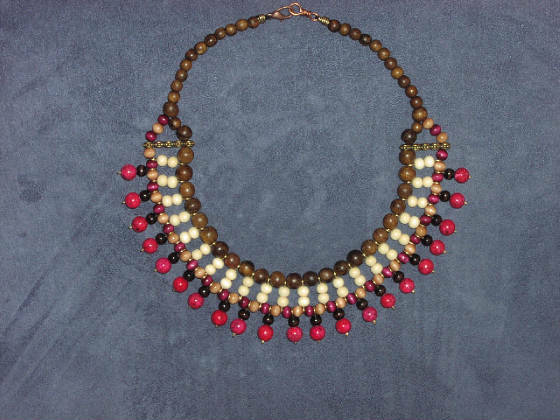 #100: Egyptian style collar made with wood and glass beads: $50. 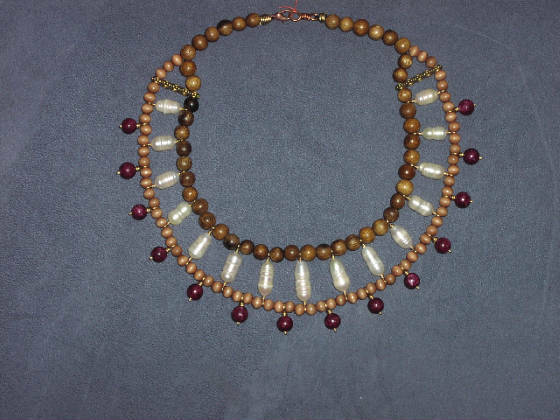 #103: Egyptian style collar with freshwater pearls, wood and fossil beads: $50. 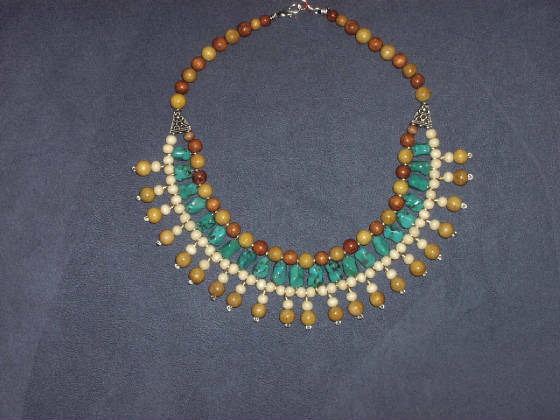 #102: Egyptian style collar made with turquoise, wood and sterling accents: $60. 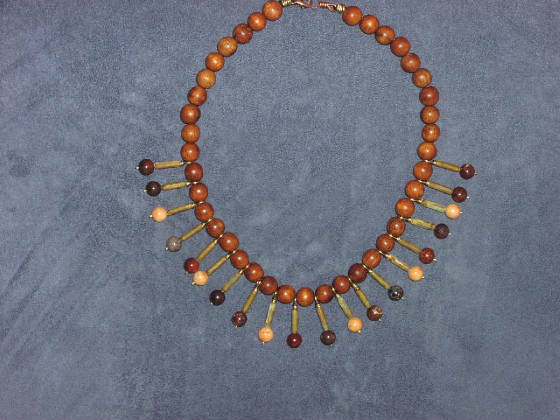 #011: Wood and jasper sunburst necklace: $40. 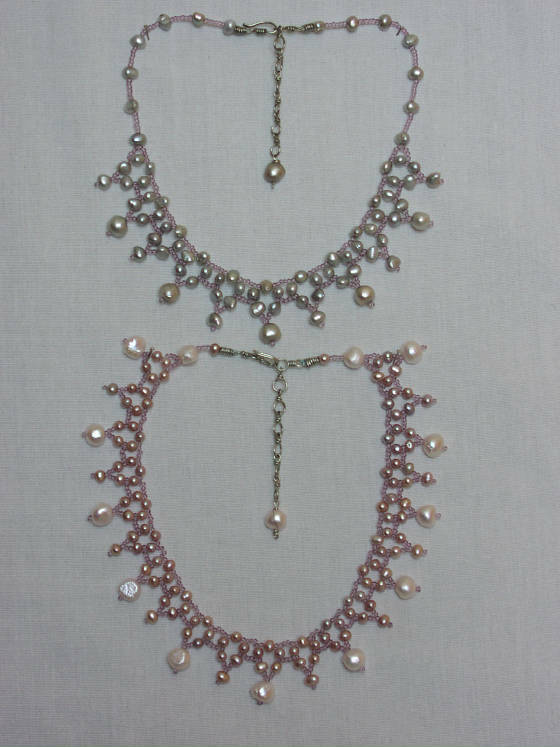 # 206.jpg: Elizabethan style freshwater pearl chokers: $60. each. 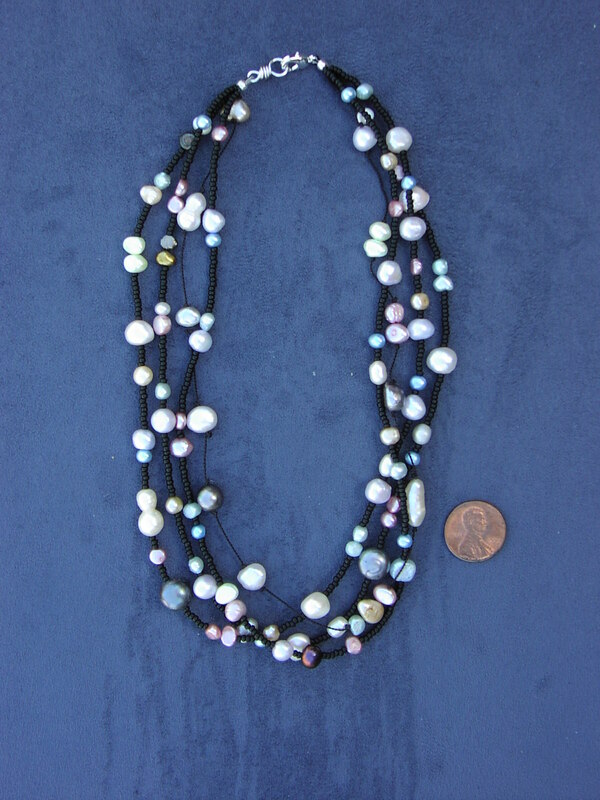 #205: Handwoven freshwater pearls and glass necklace: $52. 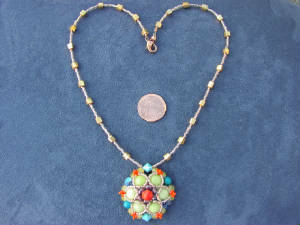 13 photos above: Handwoven star pendants: $42. each. 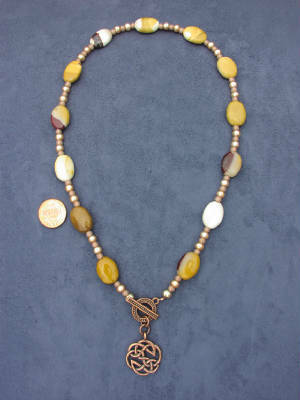 These little jewels come in an amazing array of colors and materials, including amber, stones, crystals and pearls! Some look very floral, inspired by the beautiful spring we are having right now. 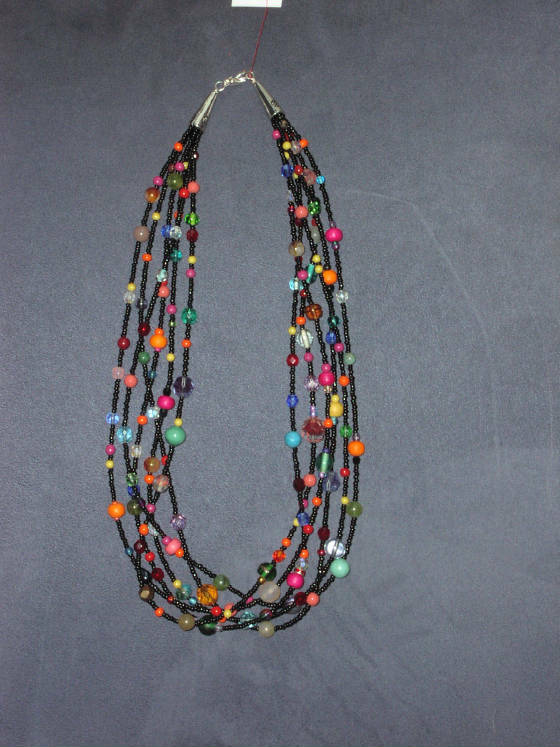 # 382: Bib choker necklace, handmade metal links with black matte seed beads....multi-colored glass, stone and crystals beads dangle inside the "windows" like stained glass. This piece drapes like fabric and no two of these will be exactly the same! : $75. 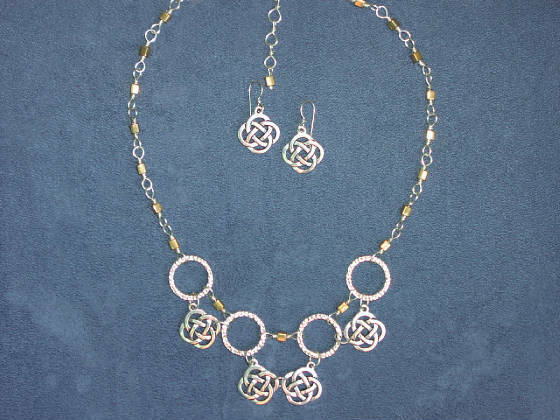 # 285: Celtic knots minimalist necklace with Swarovski crystal and sterling chain. About 17" long. $42. 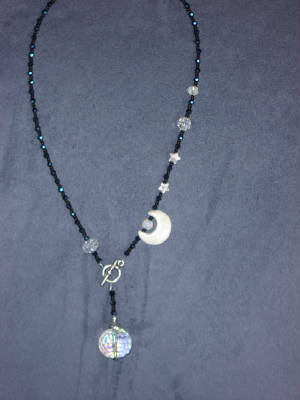 # 262: Asymmetrical howlite crescent moon and stars necklace with Swarovski crystal and front toggle closure. 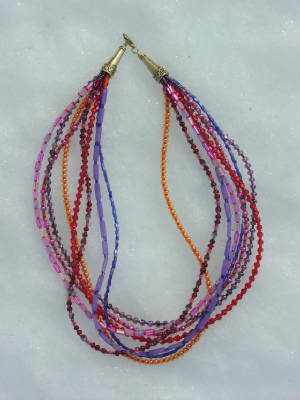 Fire polished glass drop with Celtic braid bead cap. 17" long. $52. 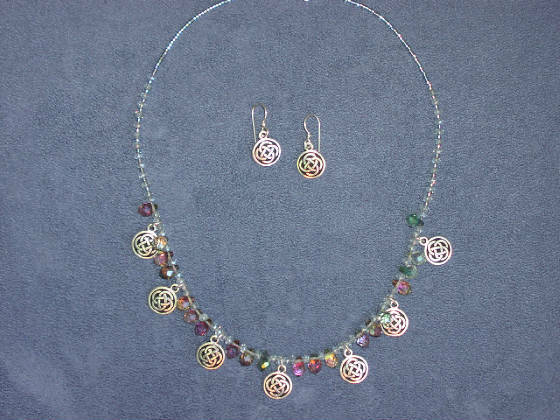 # 279: Falling leaves stone bib necklace with Celtic knots, hand wrapped with Artistic Wire. Approx. 16 and 1/2" long plus extender. $75. 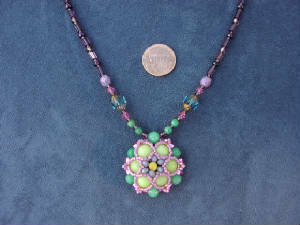 # 281: Three Ring Celtic Frog Circus necklace....see the frogs climbing up the handmade chain? $48. Matching earrings with silver filled hooks: $14./pair. 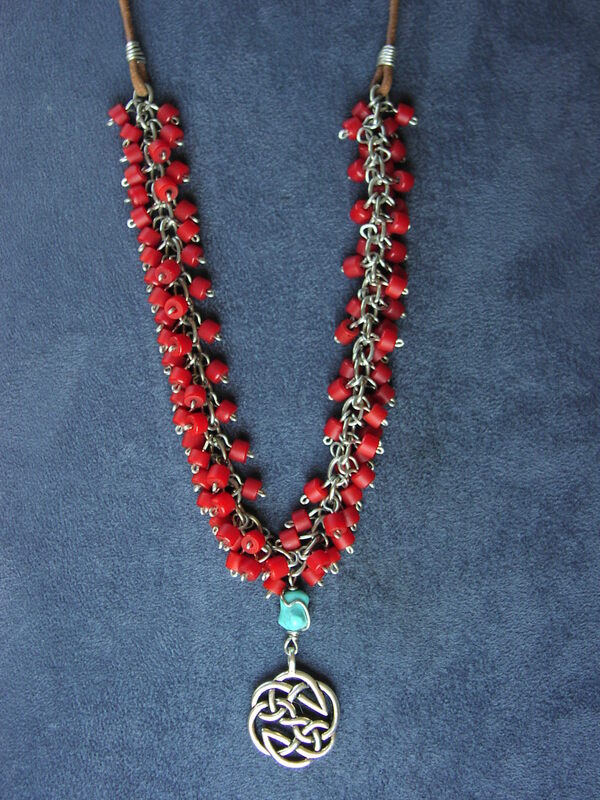 # 256: 17" double Celtic hearts asymmetrical necklace in rose, reds and silver....the look of a lariat in a necklace that stays comfortable and stays put: $48. 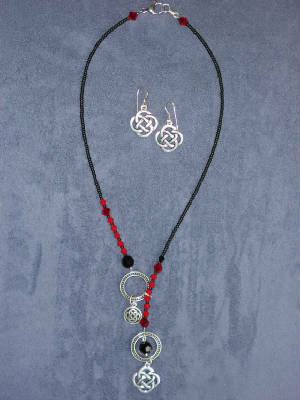 # 258: 17" asymmetrical Celtic knots necklace in reds and black with Swarovski crystal...kind of a goth look, very elegant, too: $48. 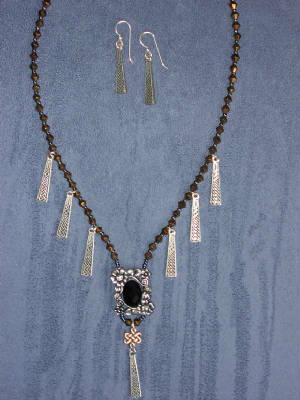 # 260: 17" asymmetrical minimalist necklace in black and two toned metals. 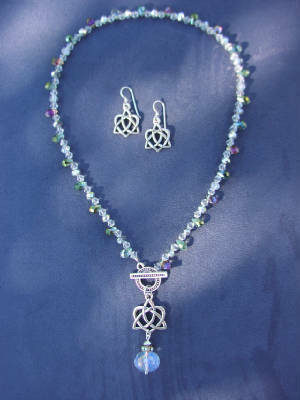 Celtic knots and glass: $48. 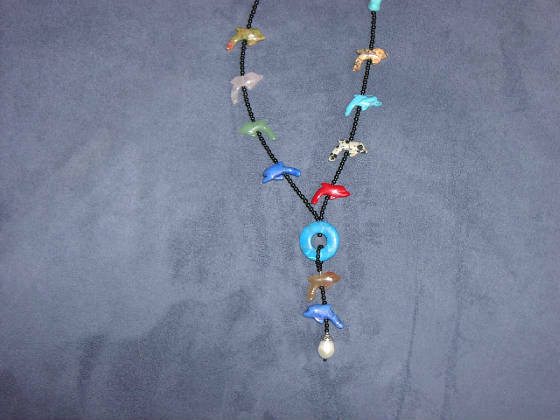 # 261: 24" handcrafted stone dolphin fetish necklace with dyed howlite circle pendant and large freshwater pearl drop with Celtic braid bead cap: $58. 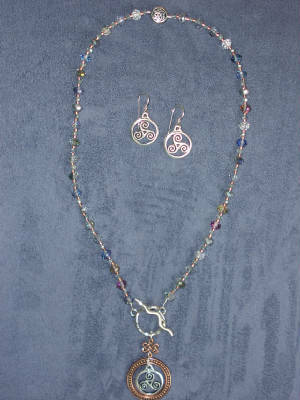 # 257: 17" asymmetrical Celtic knots necklace with glass and Swarovski crystal. 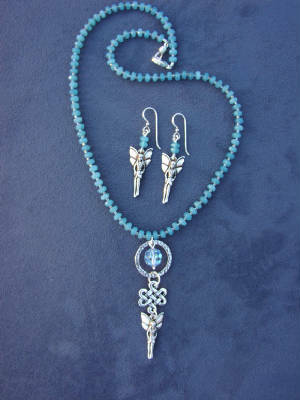 This piece has the look of a lariat and the comfort of a standard necklace: $48. 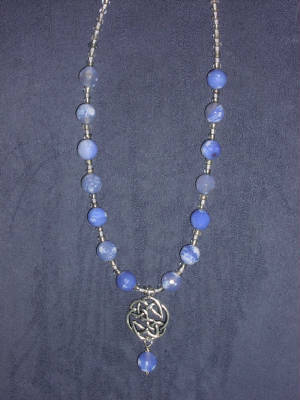 # 230: Celtic knot necklace with blue agate and glass....very pale, icy look: $48. 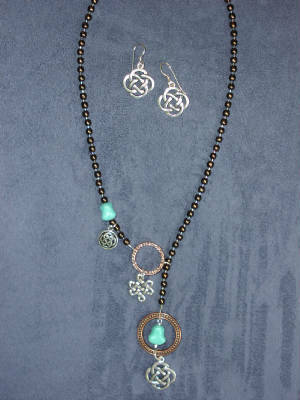 # 023: Pewter Celtic knot necklace with African glass beads, leather, and turquoise accent: $56. 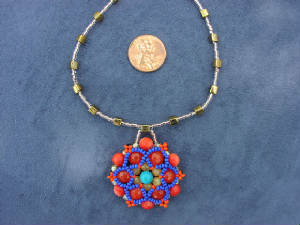 Movable beads add interest and fun to this unique piece! 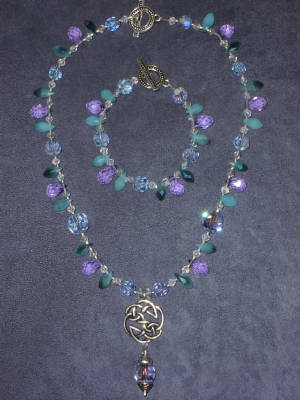 #240: Celtic knot necklace with dyed blue agate and glass: $48. 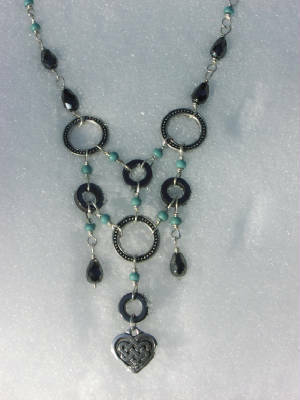 # 291: 17" obsidian (volcanic glass) teardrop necklace with dyed jade, Czech. 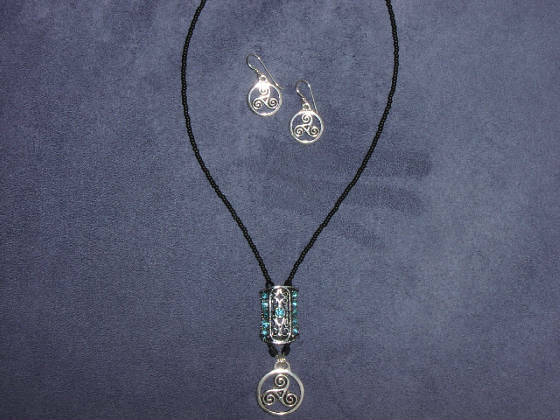 glass, Celtic knot, and front toggle closure. $48. 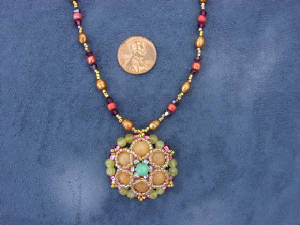 # 016: Long "Talisman" necklace, featuring stones, charms and unique components from around the world. No two pieces alike. $68 each. 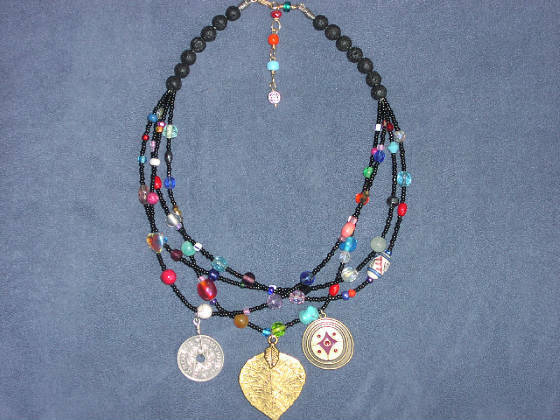 # 207: Short multistrand "Talisman" necklace, featuring stones, coins, charms and beads from around the world. No two alike: $52. each. 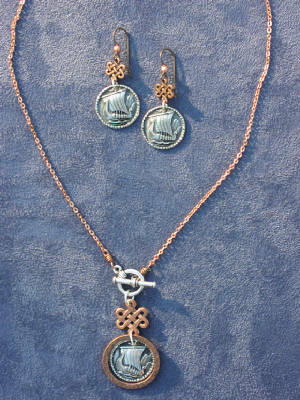 Shown with matching Celtic knot earrings: $16./pair. 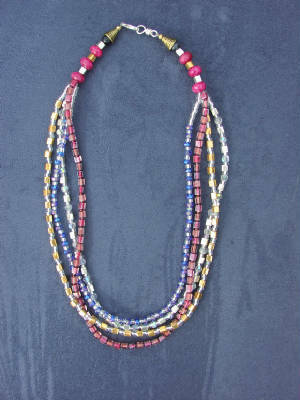 # 186 Multi strand, multi color glass necklace: $40. 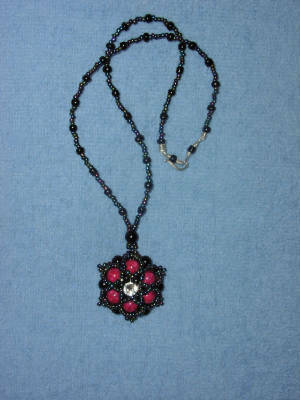 This one is shown in shades of red, orange, pink and purple , but it can be made in any colors. Special orders for materials other than glass can be requested and prices will vary. Matching earrings available: $12/pr. 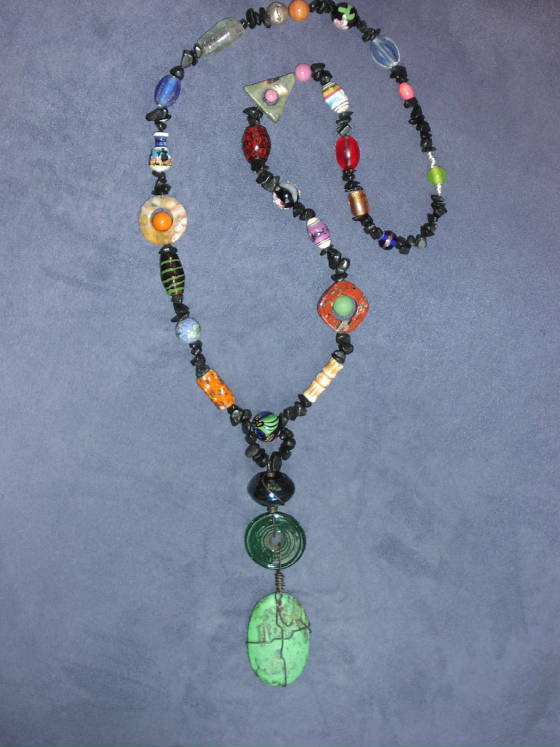 #101: Multi strand, multi color necklace--shown in black with a variety of colorful glass, crystal, stone, porcelain and other types of beads. No two alike: $48. each. Matching earrings available. 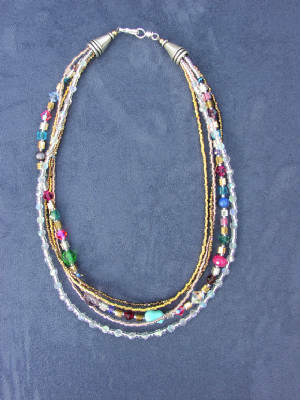 # 288: Multi-strand necklace with turquoise, Swarovski crystal, dyed quartz, silver and gold glass...no two exactly alike. Approx. 17" long: $48. 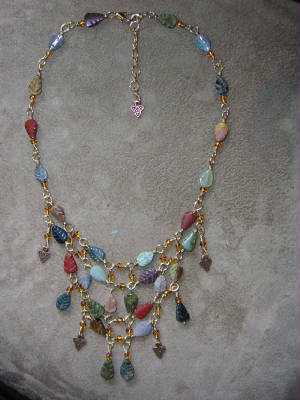 # 289: Multi-strand necklace with glass and dyed quartz, approx. 17" long: $42. 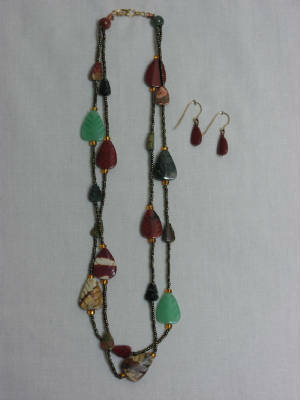 #003: Stone leaves double strand necklace made with a variety of semi-precious stones and glass seed beads: $42. Matching earrings available in large or small (pictured) leaves: $12. 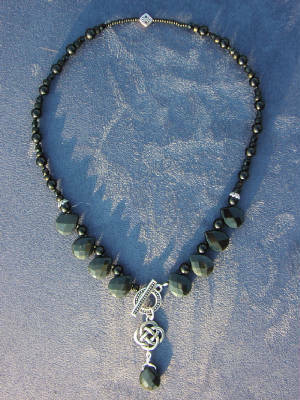 # 204: Handwoven necklace made with freshwater pearls and slate colored glass seed beads: $48. Matching earrings $15. 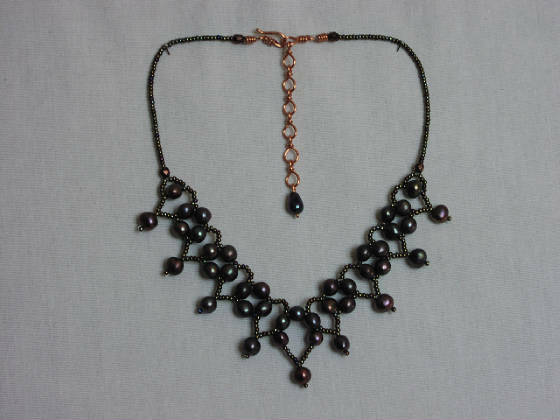 #010: Handwoven pearl and glass necklace, shown in white with brown iris seed beads and copper. 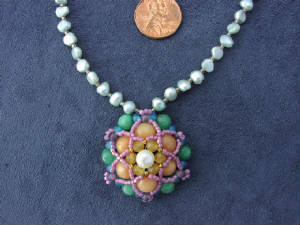 Custom orders welcome, can be made with any color pearl and glass, and with silver or gold clasp instead of copper: $48. 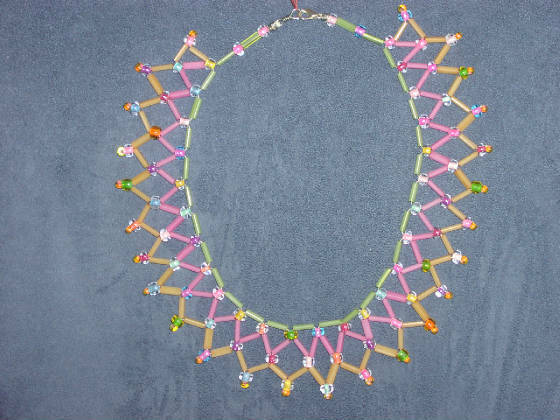 #216: Netted choker in pastel colors: $42. 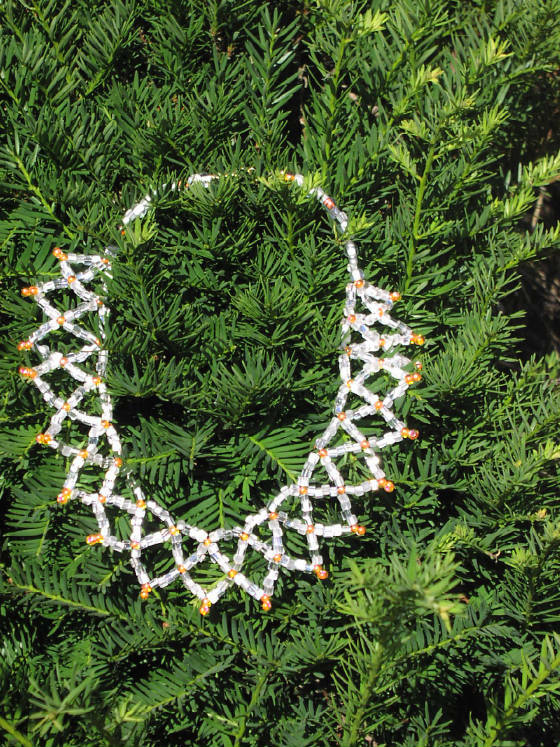 # 024: Woven glass necklace, shown in white with orange accents. Netted design can be made in any colors: $42. each. 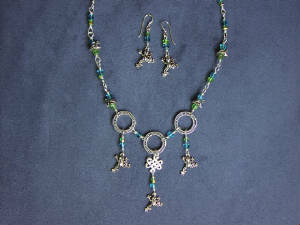 Matching earrings are available for all necklaces.